The University of Southampton has boosted its ecological commitment by being the first university in the UK to use the world’s best-selling electric van. 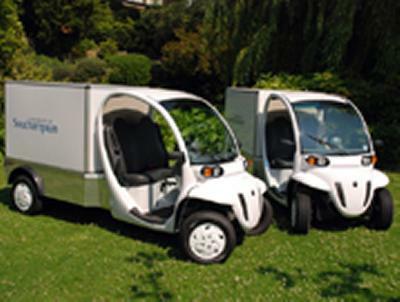 Two GEM electric vans have been bought by the University’s estates and facilities department to transport heavy loads around the campuses. The new vehicles are so small and quiet that they can access parts of the University that were previously inaccessible to cars. More than 40,000 vehicles have already been sold worldwide and are being used by police forces, the military and NASA. Being road legal, 100 per cent electric and creating zero emissions, the new environmentally-friendly vehicles enhance the University’s green credentials. The University of Southampton’s Repairs Service Manager Jason Wyatt says: “These vans will be a huge boost to the effectiveness and quality of the work that our department does around the University. “Their small size and quietness means we will be able to transport staff, tools and materials to previously inaccessible areas of the campuses. “This is important as it strengthens our commitment to improve the health and safety of the manual handling of heavy goods. GEM - a division of Chrysler – has been manufacturing the worlds’ best selling electric vehicles since 1998. Gem Cars are assembled in France by Matra MS and over 40,000 GEM vehicles have sold worldwide and are used by police forces, the military and NASA among others. All GEM vehicles are road legal, 100% electric and 100% emissions free. They can be used safely indoors, cost less than 1.5 pence per mile to run and have a top speed of 30 mph (which can be restricted to 15 mph or less if required). Since 1998, GEM owners have driven their GEMs over 150 million miles, saving 7.5 million gallons of petrol.